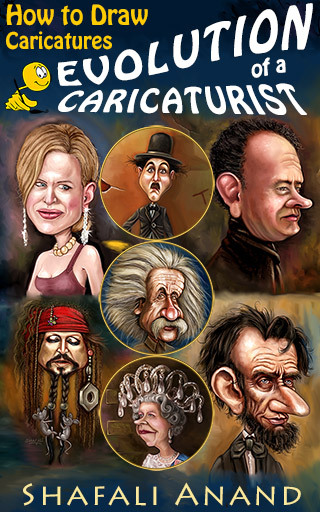 The eBook “Evolution of a Caricaturist – How to Draw Caricatures” now on the Kindle Store! If you are interested in learning how to draw caricatures in a methodical yet fun way, its waiting for you here. 2013 was a very busy year for me. In July when I had decided to publish the book, I was relatively unoccupied and I thought that it would be a breeze. Yet as time went on, I was doing more assignments and programs, and I realized that it wasn’t going to be easy. You see, a book about drawing caricatures isn’t like any other book. It’s a journey into a wonderland of faces where you are your reader’s guide, and you use any and all means necessary to help your reader understand, appreciate, and apply everything that’s in there. The book needed illustrations (it’s got a little more than 70 of those,) it needed analysis of faces and discussions on caricatures, and above all, it needed to be readable. In a nutshell, it needed commitment and time. I am never short on the first, but almost always on the second. There were times when I wanted to stop because I was tired, but then someone across the world would sign-up for it, and I’d forget my aching limbs and switch on my computer, and then I’d lose myself into the book. I think I’ve poured everything I knew about drawing caricatures into the book – the thoughts, the techniques, the methods, the concepts, and the real-issues with their possible solutions. I know that most artists would rather draw than read, I trust that most artists like to know how something’s done and then do it their own way, and I believe that this book is written for the artist in us. With hope and love, I place this book in your hands.